The overscroll bump is a nice addition to Windows 10’s aesthetics. I like to sometimes just use the touchpad of my laptop for watching various windows animate and get bumped. The problem is with it, however, is that it is sometimes a lot apparent and obtrusive. I like my workflow smooth without a lot of clutter. With Windows 10’s crapload of animations, this is not feasible. Overscroll is just one of many, but this is the first one I’ll be tackling. If you don’t this overscroll animation pleasing, there is a simple registry tweak that you can do to make it go away. You just need to edit a registry key inside the registry editor in Windows 10. This, however, requires a bit of search from your part. It’s not much, though. You just need to find out the provider of the touchpad on your laptop. For that, you have to go to the Control Panel and view the Mouse properties and note the name of the touchpad provider. The most common touchpad providers that this will trick will work within the market are Synaptics, ElanTech, and ALPS. If yours is not among these three, this should still work for you, but no guarantees. Head over to the Control Panel on your PC and open Mouse properties. Click on the Hardware tab and note down the touchpad manufacturer name in the Devices list. Press Win key + r to open Run box and type regedit.exe. Press enter. 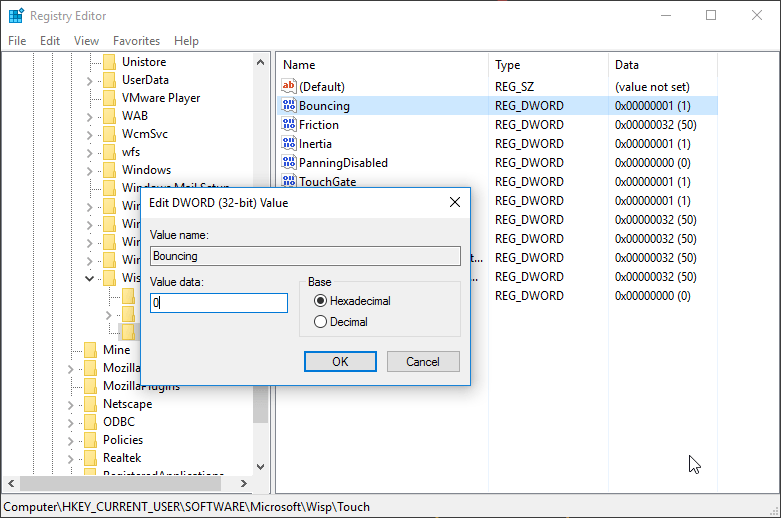 In the Touch folder, edit the entry named Bouncing from 1(enabled) to 0(disabled). After making that edit, restart your PC for the registry changes to be honoured. This will disable the overscroll effect in all the windows while using the touchpad for scrolling. Didn’t work for my Lenovo Yoga 910 Synaptics Clearpad.